KUALA LUMPUR, April 17 — An Indian literature group has accused the Education Ministry of denying non-Malays rights to Bahasa Malaysia by saying the Dewan Bahasa dan Pustaka (DBP) dictionary belonged only to Malays and cannot be questioned by other races. Kayvan Literary Group (Kayvan) president Uthaya Sankar SB said today the ministry’s stand showed it was trying to deny that the national language belonged to all Malaysians regardless of race. “A response like this that represents the Malaysian government will surely frustrate noble attempts to raise the status and dignity of Bahasa Malaysia, as well as efforts to build Bangsa Malaysia,” he said in a statement. This comes on the heels of the Education Ministry’s response to a report in Tamil daily Makkal Osai on March 31 that the Kamus Dewan contained words offensive to Indians. The ministry’s statement had stressed that words in the Kamus Dewan must be seen from the Malay perspective and not from that of other races, pointing out it compiled words used in Bahasa Malaysia, including those borrowed from other languages like English, Chinese, Sanskrit, Tamil, Dutch and Arabic. It said that all races in Malaysia must accept the fact that the Bahasa Malaysia dictionary reflects Malay language, customs and culture. “There are words used daily that are regarded as obscene by other races but not to Malays. There are also words that are considered precious to Malays but seen as insulting by other races,” the statement by the ministry’s corporate communications unit said. DBP is under the supervision of the Education Ministry. The Kamus Dewan, first published by DBP in 1970, is now in its fourth edition. Uthaya Sankar also pointed out today that the statement ran counter to the government’s goal of getting young people of all races to use Bahasa Malaysia, as well as efforts to get parents to send their children to national schools. “The ministry should take steps to democratise Bahasa Malaysia and not restrict it to a particular race,” he said. He warned that if no action is taken to clarify the misleading statement published on the ministry’s official online portal, Bahasa Malaysia risks being seen as a language that belongs to one race only. Uthaya Sankar, nonetheless, said that Kayvan, founded in October 1999, will continue to uphold Bahasa Malaysia as the language of all Malaysians. I was disgusted after I heard the story that was relayed to me by my daughter and it compelled me to write about it. It seems that the indoctrination of racism into the minds of the rakyat, especially the Malays, does not stop at government departments nor BTN for the working adults but has steadily and surely gained a foothold in public colleges/universities and now even in sekolah menengah in Malaysia. My daughter had attended an extra curricular society meeting in school recently. drawing of lots. Which to me is fair and square. Apparently, after the lots were drawn and tickets were distributed to the successful draws, some students were unhappy that they did not get the tickets. What happened next disgusted me. A Malay student who had failed to secure a ticket stood up and commented that tickets should have been distributed according to the race quota as practised in Malaysia! Imagine, this coming from a Form 4 student. Even the three teachers were shocked to hear what that student had just said. The student also had a few supporters amongst her peers who agreed with her comment. Fortunately, one of the teachers who is Malay, told the students that the school does not practise discrimination and that all students are equal and tickets given after the drawing of lots was fair and just. Hence the discussion on the matter should stop there. Imagine, a secondary school 16-year-old having said this. She has not even begun working, so one would speculate she must have been told of her ‘rights’ either at home or by her racist peers or elders. This is just one example in one form in one school, what might be the situation in the other forms across the schools? And worse, what if this is the attitude they have been hearing from their own teachers? Imagine the detrimental impact to the future of this country with our youth showing such racist behaviour from such a young age? Apparently, Najib’s 1Malaysia is not working and is proving to be so, what with Perkasa and other racist NGOs spewing racist comments that undermine his ‘efforts’. The PM seems to stand alone with his so called ‘vision’, when some of his own Umno peers are distancing themselves from his vision. Remember Muhyiddin’s comments, “I am a Malay first before I am a Malaysian”? And this guy plans to take over from Najib in the near future? What will Malaysia become? How do you expect all the races in Malaysia to live in harmony when some of us are painted as lesser than another race, that we are squatters, that we are undeserving because of our background and skin colour? We, the non-Malays, have also contributed in one way or another through blood (the Emergency), sweat (toiling in tin mines, rubber estates and forest), tears (hardship and endurance) to help bring this country to where it is today. Slowly but surely since 1970 and the NEP, we have seen severe discrimination of our social, economic, educational and political rights with no end in sight. Is this what 1Malaysia is about as professed by Najib? Then, we might as well stay the way we are and just turn a blind eye towards the country, which is exactly what is happening now. Brain drain, migrations, flight of investment either local or foreign is all a result of the government’s racist and perverse policies that do not seem to be abating in the near future, especially with such young citizens already spewing the poison from their thoughts and mouths. What the future holds, only God knows. 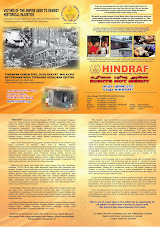 Photos: New Jersey State Deputy Speaker Upendra Chivukula attends Hindraf Human Rights briefing at Rudgers University 9th April 2011. UMNO denies Hindu class in schools when whole of Fridays taken up for Islamic classes and prayers. 80% truancy on Fridays by non muslims. And the non Malay muslim students are excepted to study moral lessons (as if they are immoral) or loiter around school, do their own work etc., so much so that students are refusing to go to school because for them almost the whole day is wasted. So UMNO uses their Hindu Sangam to do the usual kosong wayang kulit and keep giving false hopes of “Tamil religious lessons to be held in schools soon” (see The Star 15/4/2011 at page N61). With the key words being “to be held” and “soon” as in the future continuous sense.